Set of 14 Divers Silicone Replacement bands! These watch bands have built-in installed adapters on them, so they can fit your Apple Watch® Perfectly! 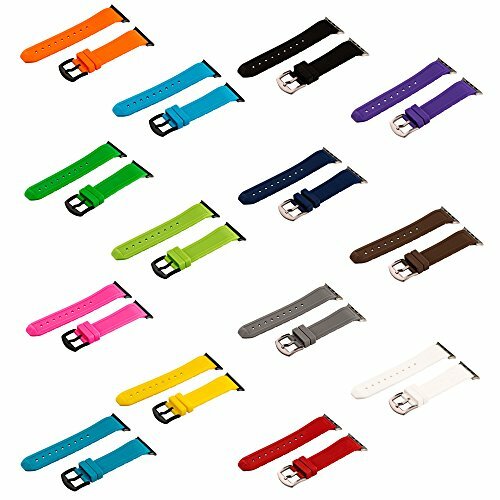 We have been selling watch bands for over 10 years. You won't be upset with our quality :) All watch bands are shipped with our branded Clockwork Synergy® Box! Colors of bands included in this set: Black, Brown, Navy, Grey, Turquoise, Sky Blue, Purple, Emerald Green, Lime Green, Red, Orange, Yellow, Pink, and White. Length of bands: 120mm / 75mm Hardware Options: Brushed Steel or PVD Black. Please feel free to ask us any questions you may have!! Genuine Clockwork Synergy® replacement Watch Straps! Branded Clockwork Synergy Watch Box with every order! "Instantly Add a Little Class to your Wardrobe"
If you have any questions about this product by Clockwork Synergy, LLC, contact us by completing and submitting the form below. If you are looking for a specif part number, please include it with your message.